Dora Maar has fascinated me for some time. Her story is touching, if not laced with melancholy and a hint of insanity, much like Picasso’s own paintings of her. And even while I write this introduction I am aware that I have fallen into the trap that made her life so tragic. You see Dora Maar lived in the shadow of her lover- and I begin writing on their first meeting. The 29 year old surrealist photographer and painter was introduced to Picasso in his flat on rue de la Boetie in March 1936 by Paul Éluard. The two began a ten-year affair spanning the entire length of the Spanish Civil War and the Second World War and she quickly became the rival of Marie-Thérèse Walter, Picasso’s blonde French mistress who provided him with a daughter named Maya. 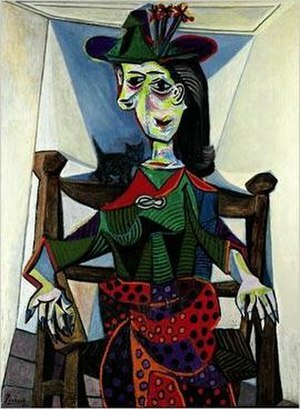 Both women modelled for Picasso and the differences between the paintings of each are telling. Walter appears sunny and bright. There is a certain optimism and warmth to her that perhaps relates to the young age at which he met her and also her ability to produce him a child. Maar on the other hand, who was to be held in posterity on canvas as the ‘Weeping Woman’, is presented as dark and tortured. Picasso, apparently, was entranced by this beautiful dark haired girl who, upon their first meeting cut her fingers at the table in front of him. She often found herself falling into depressive moods, particularly following the discovery that she was sterile, and she spent sometime being treated with psychoanalysis. She spurred Picasso on politically and was also to gain some notoriety for the photographs she took of the successive stages of his Guernica painting. Throughout this time, Picasso would flit between his two lovers according to events and moods and would later leave Dora for a young painter named Francoise Gilot in 1944. Picasso’s departure from her life hit Dora hard. She was to face further heartache with the unexpected death of her mother and Nusch Eluard, her best friend, which left her without any close friends of family. She soon found solace in Roman Catholicism, and was quoted as saying “After Picasso, God”. She was admitted into a psychiatric hospital and underwent shock therapy but remained obsessed with her relationship with Picasso. She did eventually begin to recover and began moving in social circles with figures such as Marie-Laure de Noailles, Lise Deharme and James Lord but by the 1980s she was reclusive and penniless, despite a successful exhibition of her paintings in 1990 and another in Valencia in 1995. She died in Paris at the age of 89 having never sold the artworks Picasso left her, despite the fact that they would have garnered her a small fortune. Her whole life, it seems, was lived in the shadow of this man. And yet I do not belive she resented him for that. Even her most recognizable photographs star Picasso, and when her work is exhibited today Picasso’s name is inevitably present within the first two lines of any release. It seems impossible that one other soul could have such an iron hold over another and yet Dora appears to be proof that it can happen. I don’t know whether I pity her for her obsession or love her for her loyalty. Was she a hero or an idiot? Or, perhaps, both? I don’t know. I sometimes think that it is some people’s purpose to be the source of inspiration for others. My concern comes with the fact that often they are not aware of this role. They believe that they are getting a fair exchange from the situation – that it is a mutual relationship built upon a deep love and affection. Rather, the sad case is that they are more than often sucked dry and then discarded while an artist moves onto their next obsession. But if this is the case, who is to blame? Is it Picasso for his behavior towards her? Perhaps he deceived her by telling her he loved her while just using her. Or maybe he did love her. Maybe the passion which we see expressed so articulately upon the canvas was just too great to be held by just one other person. But if this were the case it does not excuse the manner by which he abandoned her and moved onto another. What I cannot yet come to terms with is the concept that an artist, no matter how great, is excused the natural moral codes of the rest of society. The idea that someone can expel someone from their lives once they no longer ‘inspire them’ is utterly repellant to me. And yet here is Picasso, the creator of such sympathetic and loving art committing just such an action. It speaks volumes about Picasso, I believe, but even more so about Dora – after all look who this piece has turned around to once again?